It can seem like these successes are just one-off acts of ingenuity or isolated flashes of brilliance… but are they? In today’s world you need more than just an occasional burst of creativity. You need a consistent attitude, a proven strategy, and a tactical plan for execution. 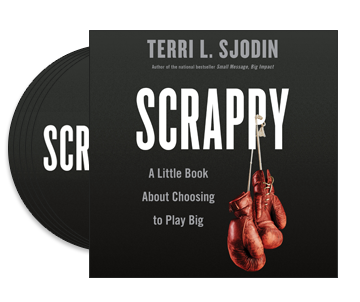 That’s where Terri Sjodin’s Scrappy can help you, by explaining and demonstrating the unique elements behind any successful scrappy effort. Total Playing Time: Approximately 5 1/2 hrs.